Cushion moss, often known as white moss, is a species of plant notable for its plush, slightly grayish-white and green coloration. Like all mosses, they enjoy moist environments and can grow in most places with that type of climate, propagating on almost any surface either naturally or applied via a transplant or a liquid moss solution. Cushion moss will need to be watered often if the air is dry or it will begin to die and go brown. Cushion Moss is a unique moss with many unusual characteristics. 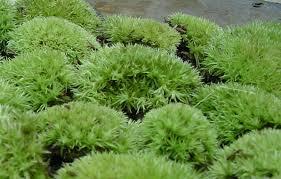 It is often called white cushion moss because of the white sheen that gives it its light green color. Found in nature covering large areas of shady parks and woods, cushion mosses are some of the most versatile and useful mosses, with many practical applications outside as well as inside. This moss grows slowly and spreads through spores, which cause many cushions or patches to grow carefully with each other. Over time, these can develop into a light green lawn. 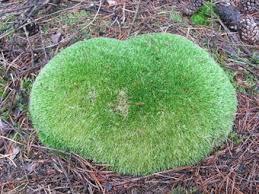 Cushion moss prefers sandy, acidic soil over richer, darker soils. Sometimes found on the edges of shady rivers or old stream beds, it grows best under damp conditions because it lacks real roots. Water must be obtained by the plant from its immediate surroundings through osmosis, and if allowed to dry out, it will enter into a dormant state until it is pre-moistened. Most cushion mosses are found on the floors of well-established forests in the almost complete shade. Care should be taken to avoid heavy foot traffic over large sheets. Indoors, it can be put to use as a top layer in hanging flower baskets and other potted plants.The light green of the moss contrasts well with the darker green of many houseplants, adding beauty as well as holding moisture in, which reduces the frequency that plants need to be watered. If care is taken to place it in its ideal conditions, cushion mosses can make a significant, low demanding ground cover. Cushion Moss can make great ground covering due to how soft it is.